On May 4th and 5th, the SFU-UVic Digital Pedagogy Network met in the sunshine at UVic for the Digital Pedagogy Symposium. 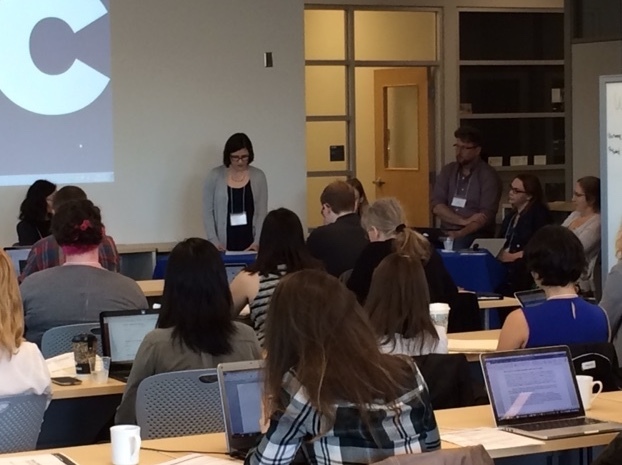 The two-day event was held in the newly-opened Digital Scholarship Commons at the UVic Library, which featured presentations, breakout sessions, and skills workshops for our network of students, librarians, faculty members, and open education specialists. UVic’s University Librarian, Jonathan Bengtson, provided a warm welcome for the DSC’s inaugural event, and began a day largely dedicated to panel presentations. The first of these was “Networked Pedagogy,” which saw presenters take up a variety of possibilities and challenges around collaboration. Claire Battershill (SFU) looked at open digital resources and underscored collaboration’s potential to change institutional relationships. Rebecca Dowson (SFU) pointed to challenges faced by collaborators and suggested ways to overcome them in creating communities of practice. Ray Siemens (UVic) elaborated on emerging avenues of collaboration to communities of digital humanists. Colette Colligan (SFU) and Michelle Levy (SFU) jointly discussed the possibilities of material and virtual spaces for collaborative work. The second panel of the day was “Open Pedagogy,” which took up the possibilities and challenges of using open resources in the classroom. Juan Pablo Alperin (SFU) discussed how he uses the annotation software hypothes.is in his teaching so students can benefit from peer and instructor comments. Alyssa Arbuckle (UVic) offered a caution about the exploitation of open resources by for-profit publishing. Matt Huculak (UVic) and Savannah Gale (UVic) provided perspectives as instructor and student on a class assignment to archive personal artefacts, with Matt reminding us that instructors may not know how comfortable or enthusiastic their students actually are about online tools. “Open Software for Pedagogy,” the third panel, continued discussion into the use of digital tools in the classroom, with students and instructors offering examples of successful digital projects. Lindsey Seatter (UVic) discussed her experience using WordPress in the classroom (see the website here). Alison Chapman (UVic) and Natalie Boldt (UVic) offered instructor and student perspectives on using Omeka to create a collection-based project (here). Reese Irwin (SFU) presented on her use of Zotero and Obvibase in building an open bibliography (here). The next panel, “Building Infrastructure for Digital Pedagogy,” turned to the makers of digital tools for teaching and learning. Michael Joyce (SFU) presented his work on the digital archive of SFU’s collection of Lyrical Ballads. David N. Wright (Douglas) discussed the importance of makerspace, introducing his own hackerspace at Douglas College. Alison Moore (SFU + PKP) showcased the Public Knowledge Project’s Open Monograph Press and Open Journal Systems for student publishing. Katie Tanigawa (UVic) presented on the Map of Early Modern London’s student-centred pedagogy. This panel led to a discussion about the possibilities, challenges, and assumptions surrounding student publishing. Our final panel showcased “Current SFU-UVic Digital Projects.” Margaret Linley (SFU) presented on the book “up close and at a distance,” which featured the Lake District Online digital archive and bibliography and proposed the need to interrogate ecological metaphors for digital tools and practices. Catriona Duncan (UVic) showed her digital analysis of woodblocks in John Stow’s 1633 The Survey of London. Caroline Winter (UVic) discussed her work digitizing Mary Shelley's Gothic Tales in The Keepsake. The discussion that followed took up issues of digital materiality, the environment, and student labour. After our day of panels, we moved into groups for more informal break-out sessions. Michelle Levy (SFU) and Michael Joyce (SFU) teamed up to discuss the importance of beta-testing databases. Their group focused on the frequent uniqueness of digital tools, asking questions about different purposes for digital projects - whether for one-time research or for sharing and open use. Colette Colligan (SFU), Claire Battershill (SFU), and Lindsey Seatter (UVic) led a group discussion on digital assignments and their evaluation in the classroom. Their group shared best practices for rethinking assignments and their rubrics, underscoring challenges like social asymmetry and faculty and TA workloads. Alyssa Arbuckle (UVic), Luis Meneses (UVic), Alison Moore (SFU), and Rebecca Dowson (SFU) organized a group around the possibility of a Digital Pedagogy Network Portal, which would allow online sharing of resources between members. This sharing might include feedback on projects, community outreach, and project preservation. Ashley Morford (U of T) led a discussion on decolonizing DH, which addressed the reproduction of colonialism in both language and practice of digital tools, communities, and environments. Morford’s group discussed the importance of both developing a sustained practice of refusing colonialist language as well as being responsible to Indigenous communities that may not want their artefacts or narratives shared. The next half-day was devoted to learning new skills, as members of DH community came together to share their expertise in workshops. Belaid Moa (UVic) and Braydon Justice (UVic) led “Python for Humanists,” introducing even the most novice of programmers to the programming language and its publishing capabilities. Martin Holmes (UVic) and Stewart Arneil (UVic) provided an introduction to text encoding using TEI XML, helping participants to mark up their own texts in Oxygen. Matthew Huculak (UVic) and Lisa Goddard (UVic) introduced participants to Content Management Systems by way of Omeka, using the open source web-publishing platform to demonstrate how to digitize files and objects and create an exhibition. Amanda Coolidge (BCCampus) and Clint Lalonde (BCCampus) provided an introduction to the world of Open Textbooks, offering the practical resources and contextual knowledge necessary for participants to design their own open textbook. Many of our participants connected on Twitter to share; visit our Storify for a curation of Symposium live-tweets (which also include links to tools, projects, slides, and resources).